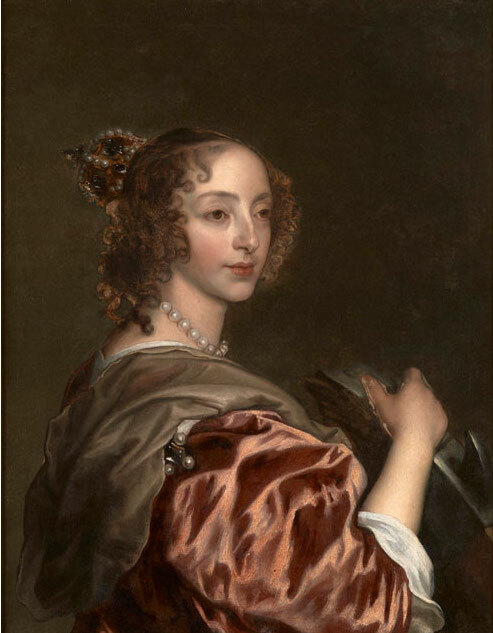 Queen Henrietta Maria (1609 -69), as St Catherine is believed to be Sir Anthony Van Dyck’s final portrait of the Queen, lost for centuries and only recently re-discovered and the public will now be able to see Henrietta Maria as she returns to Banqueting House on Whitehall, a place that would have been very familiar to the French wife of King Charles I. The small painting measuring only 76cm x 64cm is a half-length portrait of Henrietta Maria as St Catherine wearing the Imperial Crown. There is no early reference to this painting and up until now this image survived in a number of versions, none of them of high enough quality to be attributed with certainty to Van Dyck suggesting they were contemporary or later copies of a lost original by the artist. He painted the King and his queen many times and the painting now on display at Banqueting House was recently discovered by Philip Mould and Bendor Grosvenor concealed within a larger painting of the queen that had been altered and over-painted in the 18th century. To read the entire, article click here.